Taft's big mistake, I suspect, is to fetichise Councils and, by expecting too much of them, to have problems when they fail to live up to the standards he has set them. This is not surprising; given a lifetime of scholarly work on Byzantine Christianity, it is natural that he should have some of its unspoken assumptions rubbed off, as it were, upon him. And an extremely high regard, even an adulation, of councils, seems, to the poor and ignorant Westerner who is writing this, to be a marked feature of Orthodoxy (I am humbly open to correction from Orthodox readers). I have two reasons for wishing to enter qualifications. (1) I believe such an attitude gives all councils a status which is exaggerated. (2)* I believe it leaves insufficiently regarded some councils which were not formally 'ecumenical'; and undervalues the profound significance of the Magisterium of the Roman Church. (1) I believe that it is not only 'post-schism' councils which Joseph Ratzinger had in mind when he wrote Not every valid council in the history of the Church has been a fruitful one; in the last analysis many of them have been just a waste of time. And I would add that sometimes they have been corrupt, venal, and violent; sometimes they have been open to excessive influence by secular influences, whether of Roman or Byzantine Emperors, or of French kings. Sometimes, in the words Newman angrily used of Vatican I, they have been dominated by an aggressive insolent faction. And some even of the Great First Seven Councils were sparsely attended and unrepresentative of the Oikoumene. Just as we are not required to like the Sovereign Pontiff or to approve of his obiter dicta et obiter acta, though we are required to be humbly and completely subject to his authentic Magisterium, so we are not required to admire the proceedings and the participants of Ecumenical Councils but simply to accept their dogmatic Magisterium. I have said before that I dislike the absurd personality cult which surrounds a modern pope. I dislike equally an uncritical and historically uninformed enthusiasm for councils. Furthermore, as I have argued previously, those conciliar enactments which are not definitions of dogma definitive tenendum are marked with an implicit sell-by date. Addressed to the circumstances of a particular era, they are less relevant when that era has disappeared ... they pass, as I believe I once wrote, into the general background noise of the Church. Our decade is so profoundly different to the 1310s and the 1960s that I believe we have reached this stage with regard to the Councils of Vienne and of Vatican II (but not, in as far as they defined, with attached anathemas, authentic Catholic dogma, with regard to Chalcedon, Trent, or Vatican I). But I would regard as just and appropriate the censuring of a writer who called into question whether either Vienne or Vatican II was a fully authentic (in Ratzinger's word, 'valid') Ecumenical Council of the Catholic Church. That is why I would like to see Robert Taft censured, while being quite sure that there is no need to censure Joseph Ratzinger. *(2) will, DV, follow later. Taft is a Byzantinist and, therefore, might naturally have the Byzantine Orthodox in his closest view. But others would also have the right to benefit from his new hermeneutic. I am sure the Copts are dying to get an answer to the question Are the councils which excluded our Fathers to be considered ecumenical councils of the Undivided Church? If so, says who? So much for Chalcedon. And the Arians, God bless them, will want to know this: Are the councils which excluded Arius to be considered ecumenical councils of the Undivided Church? If so, says who? We will know where to put Nicaea. The Orthodox, of course, will have to eliminate Orthodoxy Sunday and other liturgical commemorations of purely Chalcedonian post-schism councils from their calendars. Taft's unstated assumption appears to be that 'the Church' exclusively means 'Chalcedonians'; that is to say, the Latin West in combination with the Byzantine East. So the first millennium (whether the Copts and the Assyrians like it or not) was, for him, that of the 'undivided Church'; thereafter, 'post-schism', the 'Church' was divided. All seven of the first seven ecumenical councils, common to Chalcedonian Latins and to Chalcedonian Byzantines but unacceptable to 'Oriental' communities, were truly ecumenical councils of the undivided Church ...... were they, Dr Taft? If so, says who? Does the Pope and Patriarch of Alexandria say so? For somebody with a distinguished academic reputation to fall victim to such preposterously circular logic is a dreadful warning to us all. Is it fair for them to be asked to subscribe to such a document when Professor Taft has a free rein to question the status of the great majority of the Church's councils? And, indeed, was it fair for Kueng to have his licence to teach as a Catholic Theologian removed, because of his lack of enthusiasm for Vatican I, when Taft can say whatever he likes? Should the excommunication of Doellinger be now, with profuse apologies, rescinded? And if Roman Authorities who leave Taft unmolested have a problem with the SSPX, what is it? But, having said so much, I admit to a certain sympathy for Taft, quite wrong though he is on this point. More about this later. Not every valid council in the history of the Church has been a fruitful one; in the last analysis many of them have been just a waste of time. Joseph Ratzinger, 1987. This great event could have been celebrated throughout the Church; and, particularly, in her educational life. Pushy young clerics aiming to advance their careers by the acquisition of a JCD could have written dissertations on The Magisterial significance of the lost Decrees of the Council of Vienne. Seminarians could have been set essays on The Spirit of the Council of Vienne: a sure guide for the Church in her Third Millennium. Sixth Forms would have been enlightened by examination modules (taught by a collaboration between the Theology and Economics Departments) on Embezzlement: its theological basis and its practical implementation. In the Church's Primary Schools, where the education is less conceptual and more vivid, teaching materials from the Bishops' Conference education offices would have concentrated on How to burn your own Templar. I feel an urge coming on to devote a few posts to Ecumenical Councils. They may probably be in the spirit of Joseph Ratzinger's wise words. Or of Gregory Dix? Or of John Henry Newman? No; of all three. IGMR (editio tertia) para 85, citing documents of 1967 and 1973, describes it as valde optandum that the faithful should be communicated with hosts consecrated in the same Mass. The same hope had already been expressed by Pius XII in Mediator Dei (see footnotes below). As far as my experience goes, this 'hope' is widely disregarded, both in the more traditionalist churches and in extremely untraditionalist Catholic churches, for reasons of manifest plain practical convenience; by communicating the laity from the Tabernacle, one avoids having to guess at the number of communicants present; a priest does not have to stand at the altar before the ablutions chewing away at what Anglicans used to call the Remains of the Eucharist; he does not have to 'renew' the Reserved Sacrament regularly because the regular use each Sunday of what was not consumed the previous Sunday does this automatically [except with regard to the Benediction Host]. But how sustainable theologically is the valde optandum in itself? "So that, through signs, Communion may better appear a participation of the Sacrifice which is actually being celebrated". Thus I literally translate the IGMR explanation. I certainly have no hang-ups with this recommendation. I actually myself rather prefer to communicate the people without recourse to the Tabernacle. I have always found it a bit of a bother to have to shift the Altar Card and unlock the tabernacle with my thumb and forefinger conjoined (and I'm often in a strange church and the Tabernacle lock and key don't quite work as I expect them to). But I am unsure how much water the official explanation actually does hold. I would take as my starting point the principle that "the Sacrifice actually being celebrated" is not so much the Sacrifice of Fr X and the good people who have walked or driven to his church on that particular morning, as it is the One Sacrifice of Calvary; what those of us who are proud of our Anglican Patrimony instinctively think of as the Lord's One Oblation of Himself once offered, a full, perfect, and sufficient Sacrifice, Oblation, and Satisfaction: Christ's offering made sacramentally present upon our Altar. Each Mass is Calvary; there are neither two Calvaries nor many Calvaries. I have a nagging suspicion that the modern valde optandum is part and parcel of the same sociological and anti-transcendent misunderstanding of the Eucharist fostered by and expressed in a desire for exclusively versus populum celebration. As Cardinal Ratzinger warned us, there is the danger of the inward-looking circle finding its own completion and fulness in its own activity rather than in the Lord who comes from beyond. There may in modern Liturgy be a subconscious fear of whatever does not come, self-generated, from within the Circle. There could even be the horrible superstition of laypeople being led to think that they ought to receive a host which they themselves had 'helped' to consecrate. 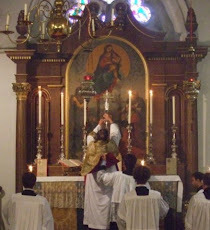 To be communicated from the Tabernacle with a host consecrated at a previous Mass reminds one that every Mass is the One Mass; that, as that great Separated Doctor of Catholic Truth (Fr Aidan Nichols' phrase), Eric 'Patrimony' Mascall, put it, a plurality of Masses is "the same thing - the same essentially, the same numerically - not just a lot of different things of the same kind, but the very same identical thing ... the one redemptive act which Christ, who died for our sins and rose again for our justification, perpetuates in the Church which is his Body through the Sacrament of his body and blood." The ancient tradition of our Roman and Catholic Church does indeed encourage us to look beyond the closed circle of those gathered here and at this moment. When domnus papa sent the fermentum, the consecrated Host from his own Mass, to be mingled with the Masses of his presbyters in the outlying Roman churches as a sign of their unity with him, the separated congregations were thereby urged to look beyond their own closed circles. Furthermore, the Pope himself, as he approached the Altar at the start of his own Mass, was shown an opened capsa containing a consecrated particle from a previous Mass, which he adored. After the Pax he placed this particle in the chalice. (To this extent, Archimandrite Taft did not quite tell the whole truth when he claimed that " ... communion during Mass from hosts already consecrated at a previous Eucharist was totally unthinkable in the early Christian East and West".) Jungmann rightly explains: "In this way the continuous unity of the eucharistic sacrifice was expressed - the same Mass yesterday and today". The mingling, with our oblata, of hosts consecrated in other places or at other times, can be a powerful manifestation of the diachronic and synchronic identity of 'our' Mass with all the 'other' Masses which are being celebrated elsewhere and were celebrated at other times. For all those 'other' Masses, together with 'ours', are truly but the one Oblatio Domini. We clergy should give appropriate respect to a recommendation of Ven Pius XII and of the IGMR when we are celebrating the Holy Mysteries. But a Catholic is not forbidden to argue that its rationale represents a dated and thoroughly unhelpful piece of thinking, which is likely to give layfolk the wrong end of more than one stick. After all, if liturgists in the pre-Conciliar period had never asked questions about the ruling praxis of their own day, there would have been no changes made in the 1960s! The heirs and admirers of those who then set aside the Liturgy of centuries are hardly well-positioned to assert that what was put in its place is beyond discussion! Footnotes: (1) When Pius XII cited (CTS translation of Mediator Dei para 126) the Bull Certiores effecti of Benedict XIV (13 November 1742; Magnum Bullarium Romanum 1752 Luxemburg edition pars decima pp 117-8) he misrepresented that Pontiff. Benedict is there dealing with a controversy "de obligatione, qua sacerdotes Missas celebrantes adstringantur Eucharistiam ministrare intra easdem fidelibus iis, qui ad ipsam accipiendam paratos se exhibent, ac petunt sacrificii, cui adstant, participes fieri"; that is, he is dealing with the desire of the faithful to receive Communion within the Mass itself and not at some other time from the reserved sacrament. Benedict is not dealing with some convenient pastoral habit by which a tabernacle is kept charged with full ciboria for the convenient and frequent communion of large numbers. I doubt (think about it!) if that habit was common two centuries before S Pius X made frequent Communion the general practice. (2) The CTS English translation of Mediator Dei by a Mgr G D Smith contains a curious omission of three words quoted by Pius XII from Benedict XIV: " ... quamvis de eodem sacrificio participent, praeter eos quibus a Sacerdote celebrante tribuitur in ipsa Missa portio victimae a se oblatae, ii etiam, quibus Sacerdos Eucharistiam reservari solitam ministrat ...". Perhaps (subconsciously?) realising that the words in ipsa Missa in fact subvert the sense which Pius XII is erroneously attributing to Benedict XIV, Smith left them out of his translation. (3) The words "de eodem sacrificio participent" in the passage I quote from Benedict XIV in the previous footnote in fact support the point I make in the second and fourth paragraphs of my main article. Whether the Host you receive was consecrated at that Mass, or was reserved at a previous Mass, you still receive "from the same Sacrifice". Revised with the help of readers from a much earlier draft. What a splendid pair of Gestures by the Holy Father: praying at the Temple Wall ... and then going on to pray at the Wall of Separation, in such a way that the world's cameras picked up the graffiti written upon it. Absolutely masterly. I won't comment further because my favourite Catholic Theologian, S Paul of Tarsus, has already got in first (Ephesians 2:11-22), as he so often does. Splendid, too, that the Holy Father has referred to the Jewish People as the 'Elder Brother'. This is theologically important and significant: it alludes of course to the Narrative of Esau and Jacob, in which God's Election rests with the Younger Brother. I wonder how long ago it was that a Roman Pontiff spoke in such laudably 'supersessionist' terms. Splendid, too, that he has invited victims of clerical abuse to join him at the Lord's Table. Such gestures are immensely useful; while he is still enjoying something of a Media honeymoon, it is right that the Pope should exploit it ... most of the worthy hacks will, of course, be unaware that his two immediate predecessors also met with victims and so they will see this latest gesture as another wonderful 'Franciscan First'. Fair enough, if their ignorance and the Pope's gesture combine to do the Church's image some good. Splendid, too, that he should put clerical abuse and Satanic sacrilege on the same level. However, sooner or later it may be necessary for the Holy Father to move beyond gestures. If there is any action which the Church should be taking with regard to the vile problem of clerical paederasty, then she should put a hold on further gestures and take such necessary actions; even, if necessary, ruthlessly. If, on the other hand, she has done everything (and more) that can be done, then she should say so robustly and call the bluff of her enemies by (1) asking what else she can do; and (2) raising the question of other organisations with a much poorer record than her own. Perhaps, too, she should address a hypothesised Elephant In The Room: the question of an alleged possible relationship between paiderasteia, epheberasteia, and some varieties of the homosexual orientation. This is not a question on which I have either views or even the competence to entertain views; but the Church could set up a group of academics with the competent skills, to work on the subject, for the benefit of humankind in general. Even if, as is likely, they were unable to present a united report, the exposition, with supporting evidence, of different positions, would be immensely valuable. It is generally useful to enquire about the roots of problems rather endlessly to get excited about symptoms. I am in the middle of a few days when I could look through some comments on posts on my blog. So if, after this last couple or so weeks, there is something you really wanted to write and you feel really irritated about not having been able to offer it during the period of Comments not accepted, I suggest you do so now, appending it for convenience to this post and mentioning to which post it is relevant. No? Nothing? Just shows how ephemeral all this stuff is, doesn't it. By the way, if you emailed me about something and got either a very brief reply or no reply, I do apologise. I returned to a couple of hundred emails and, with the best will in the world ... I am only less than human. Two intercessors for the restoration of Christendom, and of Romanita, to England. And two intercessors for a vibrant group of Christian women whose communal liturgical life exemplifies that Romanita and who are going through a time of trial. I mean the contemplative Franciscan Sisters of the Immaculate at Lanhearn in Cornwall; a young flourishing community occupying an historic Recusant House in which the continuities are unbroken. If this community were to go under, the risk could be that the House will end up as a Golfing Hotel or something similar. But I say this merely for context; it is of course for Mother Francesca, Mother Rosa, and their sisters that our prayers and Masses are needed. Dr Pusey: Newman's conversion was "perhaps the greatest event which has happened since the communion of the churches has been interrupted ... If anything could open their eyes to what is good in us, or soften in us any wrong prejudices against them, it would be the presence of such a one, nurtured and grown to ripeness in our church, and now removed to theirs". Sometimes we moderns instinctively feel that 'White' is not a colour; that White is a neutral blank sheet before we put upon it the red, the blue, the purple, the 'colours'. But No; White is not only a colour; it is a difficult colour to produce. The Transfiguration Lord wore robes "white as no fuller on earth could bleach them". In the ancient world, 'fulling' consisted of the use of chemicals most easily accessed through urine. This was why, in towns and cities, outside a fuller's shop were groin-high receptacles so that passers-by could provide fluid for recycling. The mixture fullers concocted was sometimes used as a punishment ... troublesome slaves were made to drink it. There have recently been pictures doing the rounds of Cardinals wearing completely plain black cassocks. Am I being cynical in suggesting that they may be signing up thereby to the new 'Francis' ethos of 'simplicity'? If so, good for them; I have no problems with it. I wish I'd known earlier so that I could have bought shares in Gamarelli's before this Cardinalitial rush dramatically enhanced their profits. But it does raise the question of whether the Holy Father himself ought to follow their lead. As Benedict XVI pointed out, red is the historical colour for popes*. The increasing use by Roman Pontiffs of Transfiguration White is a recent fad (modo) closely associated with the rather questionable Personality Cult of the popes since Pio Nono. Now that Cardinals are too nervous to wear red, the decent thing would be for the Pope himself to give up his rather ostentatiously flashy Transfiguration White, which seems to shout "Look how unique I am! Look how pure I am! ", and to revert to the historically correct papal Red. It would be ecological, too. His cassocks wouldn't need to be cleaned so often, and so he would be saving on expenditure and demonstrating an ecological instinct. Go on, Jorge! You know it makes sense! Red is the new Green and the new White! *See my Narcissistic Butterflies, especially Episode the Third. With regard to those two posts, taken of course from Fr Bernard Walke's Twenty years at St Hilary, there is one detail which he omitted. He wrote "other images were substituted for those carried off". The detail? Aware that a raid might be imminent, Fr Walke had removed from the church some very fine statues, and had replaced them by cheap plaster statues. When the mob had cheerfully taken away the latter, the former were put back in place ... indeed, in the precise words he wrote in his account, "other images were substituted for those carried off"!!! When the organisers of the Protestant mob realised what had happened, they were immensely indignant and accused 'Fr Ber' of deceit! Ah, the wonders of Proddy morality! Shall we ever understand it? ".... The three of us imprisoned there, an old mam, a youth and myself, could do nothing against the forty or fifty men assembled. I attempted to withdraw into myself, to say my prayers and to repeat as much of the offices of the breviary as I knew by heart ... But however much I tried, I could not escape from what was going on round me. I might shut my eyes, but I still saw men standing on the holy altar, hacking at the reredos or carrying away the image of our Lady. I could not close my ears to the sounds of hammering which now filled the church.
" ... the guardianship of the Blessed Sacrament is part of the priest's office; the two men with me realised as fully as I did that the Holy Sacrament must be defended against profanation. While we were conferring together, a man who appeared to be in charge, approached me and suggested that if I surrendered the monstrance, now locked in the safe, he would be willing for me to remove the Sacrament. I could make no terms with him. Seeing that we were preparing to defend the Sacrament at all costs, he consented to my demands and allowed me to carry It to a place of safety. ... after vesting I went to the altar and, opening the door of the tabernacle, took out the Sanctissimum. "Outside the church were a number of people ... As I came from the little doorway of the Lady Chapel carrying the Holy Sacrament, I found them all on their knees lining the pathway through the churchyard, with lighted candles in their hands. "I had passed from the noise and tumult of passion to a quiet world of faith. "That night there was a service of reparation, when the Most Holy Sacrament was borne back to the church. All along the roadway from house to church were rows of people with bowed heads; as the procession passed slowly by they sang the hymn of S Thomas: Therefore we before him bending/ This great sacrament revere; words in which the summit of man's faith is reached. Never had I so realised the God-given quality of faith as on that night when, together with this company of people, I entered the dismantled church. "During the week people were busy restoring the house of God; carpenters and masons were repairing the damage; other images were substituted for those carried off and the church made gay with many flowers; so that by Sunday it was fit for the offering of the Holy Sacrifice." Die XVII Septembris MMX Benedictus XVI in Britanniam a Regina Elizabeth invitatus Missam Pretiosissimi Sanguinis hic celebravit fides in societate quod commodum fit beatifici J H Newman exemplo illustrans. Oremus gives this translation of the last bit: "showing what advantage faith may be to society through the example of Blessed J H Newman". I would express the sentiment in the purple bit by something along the lines of "rei publicae relligionem prodesse etc." ... if I had to. But, frankly, I dislike the implication that 'Faith', meaning 'the Christian Faith', can be some sort of advantage or adornment or assistance to the post-Christian State or community. Of course, in a sense it is; but if your liner had been holed, and were going down fast, you wouldn't say "a lifeboat would be something of an advantage" unless you had iron nerves and couldn't resist going to your watery grave with an ironic litotes or meiosis on your lips. Individuals need Faith for Salvation; and states need the Kingship of Christ ... totally, urgently. Not as an advantage but as a necessity. And before SSPXers among you start crowing, I invite you to read the text of Pope Benedict's sermon, where you will discover that he says nothing remotely like what the 'translation' of the inscription alleges. (1) What did the author want to say? (2) How would you put into Latin what you think he wanted to say? (3) Does (1), in any case, fairly summarise the sermon that our Holy Father did preach on that occasion? In a couple of days, I'll publish my own answer to those questions. Fr Aidan suggested that the 1969 Missal should be renamed the Ritus Communis instead of the Ritus Romanus, since it "contains more features of Oriental provenance than the Roman rite has ever known historically"; he thinks it might be useful for "new ritual families" in, for example, India; or for converted Western Evangelicals (who, unlike former Anglo-Catholics, do not share a passion for the Roman Canon). But, as my favourite liturgist, Lenin, would put it, what is to be done? It is obviously important to do something fast, before the Advertising Standards people realise that they should be prosecuting the publishers for printing a misleading description on the spines of all our ROMAN MISSALs. Perhaps the simplest solution would be to use small razors to cut the cuckoos' eggs, Eucharistic Prayers II, III, and IV, out of this sadly invaded (and overcrowded) nest. Probably Mr Cameron would be glad to take Fr Aidan's advice and ship the cuttings out to India as part of his Foreign Aid programme. When visiting a strange church, keep a razor handy. (1) It will have to contain the Cuckoo Canons, so as to conform canonically with the Editio Typica. But their pages should be perforated at the inner edge, so as to make them easily removable without any need for a razor. (2) Could it, please, have bound in with it, as the previous translation did, the Missale Parvum: which comprised Latin texts of the Ordo Missae with a basic working minimum of Latin propers? This was for priests finding themselves celebrating in countries where they had no knowledge of the dominant language used liturgically. It would also be useful for clergy who, in accordance with the clear expectation of Sacrosanctum Concilium para 54, wish to celebrate in a mixture of Latin and the vernacular. Our old English Missal, dear old volume, had the Offertory prayers, and everything from Te igitur onwards, in both Latin and English on facing pages or columns. (3) The tabs are wrongly placed. For example, as you move on from the Preface to the Te igitur, the relevant tab ought to be on the left page, the one with the picture. And so on. Happily, the House of Commons in 1928 showed a lamentable lack of interest in the great project to Byzantinise the Anglican Eucharistic Prayer by adding to it an Orientalising Epiclesis of the Spirit; they threw the proposed rite out. That left the C of E with the 1662 Consecration Prayer and none other; this Prayer has a lot wrong with it, but in notable respects remains soberly and austerely Roman: action is besought of the Father without any suggestion that he is obliged to employ the Spirit to do it, and the old Roman concept - which also suited the Tudor mind - of stating a 'legal basis' for what is done ("according to thy Son our Saviour Jesus Christ's holy institution") is retained. My recollection of the time forty years after 1928 is that in all the propaganda of the 1960s, advocating liturgical reform in the C of E, much was made of the 'deplorable' lack of mention of the agency of the Spirit in the Cranmerian rite. Quietly superior people murmured 'Tut tut tut, we know so much better now'. In other words, identical mischief was afoot in both communions. It is not always to be taken for granted that ecumenical convergence is convergence on the truth. A basis for this disastrous ecumenical convergence was the high prestige of an old liturgical book which, in the 1960s, everybody believed was the Apostolic Tradition of Hippolytus, and thus an early liturgical rite from Rome itself. It contained an Epiclesis of the Spirit. Current consensus has now abandoned this identification of authorship and place of origin, but it was so compelling half a century ago that all the committee-generated products of that decade which still clutter up Catholic and Anglican rites have got pneumatic epicleses all over them, like the prickles on a Texan cactus. A very prolific, a thoroughly ecumenical, cuckoo was indeed at work! Dom Gregory Dix's role here is interesting. He had opposed the Anglican shenanigans of 1928 and remained strongly opposed to introducing Oriental epicleses into Western liturgies. But, like everybody else, he had fallen for the 'Hippolytus' identification. His canny and accurate instincts told him that there could not have been an epiclesis in a Roman rite of the date then attributed to 'Hippolytus'; so, in an edition of 'Hippolytus' which he produced, he omitted the Epiclesis (to be fair to him, there was some textual evidence that justified this omission). This sad tale of intrusive epiclesiphilia has an important moral: It is a bad idea to put all ones eggs into one basket. Academic fashions can change fast; it is an act of supreme historical arrogance for one decade to gamble on its own fads being Permanent Truth. It ends up with Cuckoo worship. Another and very sinister motive for this fad has been suggested: to sabotage the inherited Western Catholic practices around the Consecratory Words of the Lord and thus to attack belief in Transubstantiation. ROMAN MISSAL, it says on the spine of that splendidly and expensively produced Altar Book which everybody bought three or four years ago; so much more attractive than the old plastic Altar Books with SACRAMENTARY blocked upon them. The change was part of the Hermeneutic of Reform in Continuity, just as the earlier description had been a conscious assertion of rupture. Our Liturgy, we are now taught, is to be seen as in continuity with what preceded it, just as the Edition of S Pius V was in continuity with the printed missals of the late fifteenth century. This motive is highly laudable ... its heart is in the right place ... but I wonder whether its assertion is quite true. As Aidan Nichols neatly explained, "anaphoras ... are central to the definition of any Eucharistic style". And that is why the title ROMAN MISSAL is only a quarter-truth. The First Eucharistic Prayer, the Roman Canon, is indeed Roman. Its theology is the old theology of Consecration which preceded the changes driven in the East by the realisation that the Holy Spirit is fully God. In the Roman Canon, the Spirit only makes an appearance in the Doxology. Its doctrine is very simple: Divine acceptance is Consecration. In the Quam oblationem, we ask the Father to accept the offering; to bless it by writing it on the Official List of Eucharists (remember Christine Mohrmann's demonstration of the legalism of Roman religious thought both Christian and pre-Christian) and ratifying it (benedictam adscriptam ratam rationabilem acceptabilem). The next word is ut; the linkage is precise and intended. God is asked to accept the offering in order that it may become the Lord's Body and Blood. Then follows Qui pridie .... This qui has a sense of forasmuch as (remember all those collects beginning Deus qui ..., in which the qui clause gives the factual basis upon the logic of which we base our request which follows in the second half of the collect). The Qui pridie gives the grounds upon which we centre our confidence that the Father will do what is asked. Accept this offering so that it becomes the Lord's body; and His statements at His Last Supper form the 'legal' basis for our confident request. You know what I'm going to say next. The three Cuckoos' Eggs which follow the Roman Canon in the ROMAN MISSAL do not pray for Acceptance so that Bread becomes Body; instead, they call for the action of the Holy Spirit so that Bread may become Body. Our distinguished Anglican liturgist G G Willis wrote that "the rite has certainly become hybrid"; he surprised Roman liturgists in the post-conciliar period (they thought that Anglicans would be over-the-moon because of their innovations) by taking every opportunity to explain to them how questionable it was to "incorporate into the Western liturgy features which are not native to it, but confessedly derived from Oriental sources". IMPORTANT FOOTNOTE: Traditional Catholics sometimes make the unfortunate mistake of thinking that the sort of enquiry which I am conducting means or implies that such-and-such a sort of Mass is "invalid". This is very seriously wrong, as I have explained three times before. However celebrated, the Novus Ordo Mass contains ALL the requirements for a valid Mass. You DO receive the Body of the Incarnate Word. AND: there is no such thing as "more valid" and "less valid". A sacrament is valid or invalid, period. There is nothing in between. You may find the Novus Mass very greatly less helpful to you than the Vetus Mass. So might I. But both forms are equally valid. GOD, the significant actor, does exactly the same in each. *The following amuses me: In the full fervour of exaggerated pneumatology which gripped the East in and after the fourth century, S Cyril of Jerusalem actually taught that, in exactly the same way as the invoked Spirit transsubstantiated bread and wine into the Lord's Body and Blood, so the invoked Spirit transsubstantiated oil into the charisma of the Holy Spirit. This passage was incorporated into the Liturgia Horarum by the post-conciliar revisers ... but with the Eucharistic analogy excised from the text. They chickened!!! I am coming up to a busy period, involving visits, Deo volente, to Cornwall, Texas, Italy, Wales, and Sussex. Not being very computer literate ... and not having a mobile phone or any of those little machines one sees people clutching on trains ... and not knowing how to access my blog or my emails from other people's computers ... I shall be able neither to write any new posts from the places I shall be in, nor to read and moderate Comments. I have accordingly disabled the capacity of my blog to receive Comments. This is not permanent; but is likely to remain so for a number of weeks. Since it is rather arrogant to set oneself above criticism, when I return to normal I shall make it possible for any who wish to comment on the posts of the previous period, to do so. However, being fond of the sound of my own voice ... as we say ... I have, over the last few weeks, built up quite a 'bank' of precomposed pieces which are scheduled to pop up automatically. You will probably find that a lot of them give the appearance of commenting on what were the burning issues of some weeks previously! This is because, I am afraid, that is precisely what they will be. I am sorry to be going incommunicado, and will myself miss the worldwide sense of daily contact, and of tolerant or even kind appreciation, which is provided by dealing with comments and contacts. I hope to get back to that when the Conference Season is over. Over, then, to Autopilot! Roger, or whatever they say, and out!